WASHINGTON — Hillary and Bill Clinton earned $10.6 million last year, according to a tax filing released by her campaign Friday that sought to pressure presidential rival Donald Trump to disclose his tax returns. The filing shows that the Clintons paid a federal tax rate of 34.2 percent in 2015. The bulk of their income — more than $6 million — came from speaking fees for appearances made largely before Hillary Clinton launched her campaign in April 2015. They gave more than $1 million to charity. The Clintons’ income puts them well within the ranks of the top 0.1 percent of Americans, though they pay a higher tax rate than many of their elite peers, according to an analysis by the nonpartisan Tax Foundation based on 2013 data. The release is part of an effort to undercut Trump’s character by questioning the celebrity businessman’s record. Trump has refused to make his filings public, saying they’re under audit by the Internal Revenue Service and that he’ll release them only once that review is complete. All major U.S. presidential candidates in modern history have released their returns. The bulk of their income — more than $6 million — came from speaking fees for appearances made largely before Hillary Clinton launched her campaign. The Clintons have disclosed returns for every year dating back to 1977, in part due to laws requiring public officials release returns. She put out her most recent eight years of tax filings last summer and several years during her first presidential bid. Seeking common ground with blue-collar workers who have been attracted to Trump’s message, Clinton frequently mentions Trump’s returns as a way of underscoring how his economic plans would benefit his personal interests and questioning whether he’s as wealthy as he claims. Democrats believe Trump’s returns could be treasure trove of politically damaging information. They want to see his tax rate, charitable giving, and business dealings with foreign governments. “Here’s a pretty incredible fact: There is a non-zero chance that Donald Trump isn’t paying (asterisk)any(asterisk) taxes,” Clinton tweeted, just minutes after releasing her own returns. Clinton’s strategy is borrowed from President Barack Obama’s winning playbook against Mitt Romney in 2012. Obama repeatedly used Romney’s business dealings against him and seized upon the former Massachusetts governor’s reluctance to release certain tax records. Clinton’s campaign also released 10 years of returns from running mate Tim Kaine and his wife, Anne Holton. Over the last decade, the couple has donated 7.5 percent of their income to charity, the campaign said, and paid an effective tax rate of 25.6 percent last year. Clinton has tried to paint Trump as an out-of-touch business mogul but her substantial wealth has caused headaches. Kaine, the Virginia senator who’s spent much of his life in public service, reported a far lower income than the Clintons. Over the past decade, he and his wife earned the most in 2014, more than $314,000 in adjusted gross income. The Clintons made about 90 times more, reporting nearly $28 million for the same year. Clinton has tried to paint Trump as an out-of-touch business mogul but her substantial wealth has caused headaches. 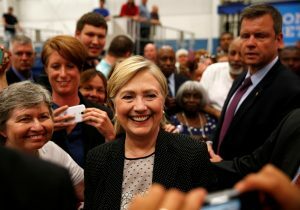 Republicans have seized upon the millions in speaking fees and a tone-deaf comment by Clinton in a 2014 interview that she was “dead broke” after leaving the White House in 2001. The couple owed millions in legal fees, but quickly generated far more from book deals, paid appearances and consulting fees. In total, the Clintons earned than $139 million between 2007 and 2014, according to eight years of federal income tax returns released by her campaign last July. The bulk of their income came from speeches delivered to corporate and interest groups, which paid Bill Clinton and later Hillary Clinton after she resigned as secretary of state in early 2013. Clinton delivered six paid speeches in 2015, including one to the Canadian Imperial Bank of Commerce. She commanded her highest rate from EBay, which paid her $315,000 for a March 2015 address in San Jose. Bill Clinton’s consulting work for GEMS Education, a global network of for-profit schools based in Dubai in the United Arab Emirates, earned him more than $5.6 million in fees between 2010 and 2015, according to the Clinton tax returns. Bill Clinton also earned more than $17 million over the same period for consulting work for Laureate Education, Inc., another worldwide for-profit education system based in Baltimore that makes most of its profits from overseas operations. Several former students have sued a school operated by the company, alleging fraud. Bill Clinton’s office last year said he had ended his consulting relationship with Laureate, but no similar statement has been made regarding to GEMS, which stands for Global Education Management Systems. His office did not immediately respond to a question about whether he still has a relationship with GEMS.